WestCOG provides planning and services for its communities to assist in mitigation of hazards within the WestCOG region. With funding from CIRCA’s Municipal Resilience Grant, WestCOG is implementing a regional version of FEMA’s Community Rating System (CRS) Program, which provides discounted flood insurance rates for policy holders. Click here to learn more. 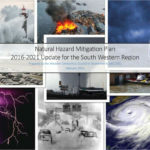 WestCOG’s former agencies (SWRPA and HVCEO) received funding to complete Hazard Mitigation Plans (HMP) for all 18 communities in the WestCOG region. The HMPs are a bridge to potential FEMA Mitigation funds and grant opportunities. The plan is designed to provide residents, businesses, and emergency responders with information on natural hazards including: floods, coastal storms and nor’easters, hurricanes, blizzards/severe winter storms/ice storms, drought, sea level rise, earthquakes, and dam failure. Additionally, the HMPs have an emphasis on providing mitigation goals, objectives and strategies for each municipality in the region. Electronic copies of these plans can be found below. 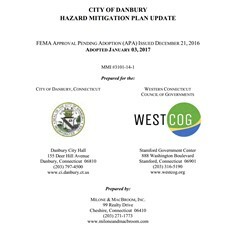 Greenwich, Stamford, Darien, Norwalk, Westport, New Canaan, Wilton, Weston are covered in this Regional Natural Hazard Mitigation Plan. Bethel, Brookfield, Bridgewater, Danbury, New Milford, Newtown, New Fairfield, Redding, Ridgefield, and Sherman are covered by individual HMPs drafted in cooperation with Milone and MacBroom. FEMA and USGS are partnered to update the FEMA flood maps within the Saugatuck Watershed (01100006 ) and the Housatonic Watershed (0110005) through FEMA’s Risk Mapping, Assessment and Planning (RiskMAP) program. While flood maps have been enhanced over the years they have not been updated since the 1980’s. The process takes around four years to accomplish. WestCOG is providing GIS data to support this effort. The Discovery Phase Report is completed. FEMA and USGS, over the next few years will be updating the flood maps for this watershed. A list of detailed study reaches planned for the Saugatuck Watershed can be found here. WestCOG has been providing GIS data to the Eversource Energy Center to support its ongoing research in various research projects. The energy center is a partnership between UConn and Eversource. Flood mapping model: Incorporates storm surge and riverine together. Current models treat the two separately. Utility damage prediction model: predicts damage from a storm and can be used to inform response. Vegetation assessment: identifies trees and vegetation which are at risk of knocking wires down and blockading roads. A land based assessment using ground based Lidar has been performed in Greenwich. The research will also help identify causes for tree falls and help explain why some trees fair better than others. Storm Wise: Strategic tree planting methods which strengthen trees from wind and reduce tree falls. Would allow for less tree cutting along road ways. WestCOG serves on the board for the Maritime’s Aquarium Sound Resilience “Get on Board” Educational Program. The program is an educational experience program for middle and high school students to learn about natural hazards, coastal environment, mitigation solutions and how they relate to one another at a local level. The program is funded through a NOAA grant, with much of the justification for the program based on WestCOG’s Regional Hazard Mitigation Plan. The U.S. Army Corps of Engineers (USACE) New England District recently signed a Feasibility Cost Sharing Agreement with the Connecticut Department of Energy and Environmental Protection (DEEP) to investigate opportunities to address flood risk management, coastal storm risk management and other related purposes within the New Haven and Fairfield Counties in Connecticut. WestCOG is working with the USACE to coordinate meetings with municipalities, provide data and reports on the region, and host web information as needed. USACE has completed its discovery phase and we are currently waiting.